Built in 1865, this bridge is said to startle some folks who go inside and see the ghosts of slaves hanging from the rafters. Others dispute this, since it was built after the end of slavery and the Civil War. Other witnesses describe the ghost of a woman seen walking on the bridge in old-fashioned garb. I have had 2 separate experiences at the bridge. My friends and I enjoy checking out haunted places and one of our first stops was at Jericho Covered Bridge. In 2010, we stopped to checked it out and take some pics (hoping for orbs or anything else we can catch on camera). As we were taking pics, we could hear a faint voice coming from creek below. We (5 of us) searched below and could not find anyone. So we assume it was not an actual person. Several months later we decided to go back. We pulled near the bushes and turned off the car. Upon exiting we began to take photos once again. Hoping for another experience like before (armed with a voice recorder), we found nothing. Upon entering the car and turning on the headlights to leave, 4 out of 5 of us all saw the same gray shadowy figure on the side of the bridge slowly walk into the bush area. We quickly accelerated and went to the location, got out, and went into the bushes….we found nothing!!! So out of about 5 trips to the bridge, we had 2 separate experiences….I would say it’s a win. The Jericho bridge isn’t haunted, I walked the bridge at midnight for a year while I was working at the Belco plant when it was open. What is haunted is the property that the 7-11 is on in Jarretsville. There was a house there that had a couple of suicides in it.There was also a mansion down 165 going towards white hall on the left side that has been torn down and another house was built there. I went into the mansion 42 years ago when it was vacant and heard all kinds of creepy noises. I tried to research the two properties and found nothing on the Internet. Me an a couple of friends were skeptical of anything being haunted…as we all went there with a evp recorder which for those of u who dnt no what that is. Its a special device that catches sounds that we normally can not here with our own ears! We were messing around an had the recorder on an was asking if anyone was there that would like to talk an who they were etc. We played it bak an the part where we asked who they were we got a response that said general an it was in a awful Erie creepy whisper. Alot more experiences have happend but I will not share !! All I can say is I will never ever step foot anywhere near that bridge again! There somthing very dangerous that is there an its not safe for the people who r venerable to those types of situations! If u dnt believe me go and find out for ur self I’m sure u will experience somthing. To this day I still have the recorder put up in my house and jus listening to it gives me the chills!!!! I have had a few experiences at Jericho Bridge. My first was in 1993.I was home on leave from the Navy and was with some friends of mine. Now keep in mind that, as teens, we would always use the Ouija board in places that we heard were haunted. We have had some experiences in cemetery with the board but DID not have it this night. As we know the legend, you are supposed to drive across the bridge and turn around at the dead end. As you come back over the bridge, you are to stop in the middle of the bridge, put the car in park and turn it off. The driver is to honk the horn twice and everyone in the car is to look out the back window. Once everyone is looking, the driver is to step on the brakes to illuminate what’s behind you. 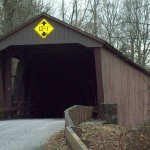 One of two things will happen in this illumination…you will see three people hanging (and swinging) from the beams (dressed in Amish Clothing) or you will see an older lady walking from the far end of the bridge towards your car pointing up and crying (she also is dressed in Amish Clothes). I have experienced both instances. The night I was with my friends (home for leave) we drove over the bridge, made the uturn and started back across the bridge. Half way, my best friend Bill stopped the car, turned off the lights and told us the legend. He blew the horn twice, and we all turned to look out the back window. What I saw in the brake lights I can never forget. Myself, my friend Rhonda and Bill (the driver) saw a woman, dressed in Amish drab, limping in a gaseous like presence, slowly moving along the side of the bridge towards our car. I have Never felt the hair on the back of my neck stand on end like I did at that moment. As she is limping towards us, you can make out her left hand forefinger pointing up towards the sky….as we look….three ropes are swinging from the beams and three shapes (lights) are circling. They looked like balls of translucent light floating. After screaming and losing our bowels (sorry), Bill left that bridge like a bat out of HELL! Three weeks later, I was back on my ship in Japan and received horrible news. Bill snd Rhonda were in a head on collision on Juraselum Rd, at the foot of the bridge. I haven’t been there since. IF ANYONE WANTS TO GO THERE AND TRY THE LEGEND,PLEASE PLEASE contact me first. My email is conwayscott2@gmail.com and my cell number is 443-968-5564. Don’t go there alone and DON’T see this as a joke! My husband & I have gone to the bridge many times, as he had a very scary night there when he was a teenager. We have tried the drive over, make a u-turn, come back, turn off car, honk, etc legend many times and nothing has ever happened. BUT 1 night there, we parked up the road & walked down because there were so many people there. There was a group of legitimate ghost hunters, with all these different types of equipment. They actually ended up following us around because they said we were constantly surrounded by orbs. They’d take a pic of a certain spot & see nothing, then they’d ask us to stand there & take a pic….they did this MANY times, & every time we were surrounded by orbs. We hung around with them for a bit and then walked to the opposite side of the bridge to do a little ghost hunting of our own. We weren’t over there long, maybe a couple mins. But when we looked for all those ppl that were there a few mins earlier, they were just gone!!! We didn’t hear them leave, didn’t see headlights or hear their cars, it was like 1 sec there were like 20 ppl there, and the next it was just my husband & I!!! We walked back over to see if maybe they were on the road, but nope. Everyone was gone. All of a sudden my husband grabbed my hand & had a terrified look on his face. He whispered “Who is that?” I looked and saw no one!! I said “Who baby?” And he just said “Him….right there….by the sign…” I looked up at the sign (like a speed limit sign or the “bridge height & weight” sign, I can’t remember which)…..I saw the sign, but no man! I started to say “Where?! ?” but before the word came out of my mouth, all of a sudden he was there. A man, leaning against the sign, staring right at us. We both took off!!! We had to run past him to get to our car, which was f-ing terrifying!!! But we did it. As we ran, we saw no other ppl, no other cars, just the man who all of a sudden appeared by this sign. We drove back by to see if he was still there. He wasn’t. We drove over the bridge all the way down the road, to see if we saw anyone walking or any cars. There was nothing. The man disappeared as quickly as he had appeared. My experience at the bridge. My husband, his best friend and myself visited the bridge one night last summer. We got there around 1am and I decided to grow some balls and go inside the bridge. Everyone warned me because it is said that that’s an easy place to get possessed. I’m very strong minded so I didn’t care. I crouched down on the side and waited nothing. I waited for about ten minutes and right as I was about to get up and leave I started listening to the water. There were people talking! So I went back to my husband and his friend and asked them what was down under the bridge. He told me it was all water. It wasn’t them talking because they were on the road right outside the bridge and I heard talking coming from under the bridge. They also said they were not talking until I walked up to them asking about under the bridge. We decided to go down there to check it out. No one was there! I know I’m not crazy and I wasn’t hearing stuff. Back in high school a few of us went on the bridge around midnight on Halloween and turned off the car. There were candles lit in the bridge and one by one they went out. Tue smoke went stright up and the candles didnt flicker like when yoy blow them out. We still figured a breeze but then looked behind us and there was a shadowed male figure and we turned on the car and sped off. Whether it was paranormal or not it still scared us. I have not returned to that bridge since.